Cord reels with outlets for convenient access to power. 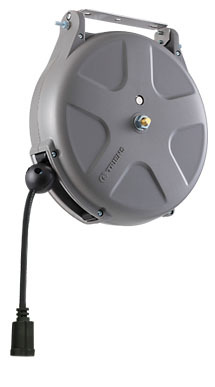 Reels come complete with power supply cord, ball stop and complete mounting hardware. flexible, oil and water resintant cord. 40ft, 16 gauge, 3wire,110V ,single plug outlet. SCS-340A U UL/CSA 16 3 TYPEB Socket 40.0 AC125V/6A TYPEB Plug 2.6 12-3/8"